Editors Note: There are often many misconceptions about views of manhood and womanhood. Most notably, Christians will either hold to "role-sameness" (egalitarianism) or "role-distinction" (complementarianism). In this post, Mary Kassian helps us understand that the presence of differences in complementarianism doesn't mean one gender benefits while the other misses out. In fact, nothing could be further from the truth when God's design is on full display. Have you ever watched a skilled couple perform a dance? Once I had the opportunity to watch a professional dance troupe perform at the Sydney Opera House in Australia. The male and female of each pair danced as perfect counterparts. They made the most intricate moves, spins, and lifts seem effortless. It was breathtakingly beautiful. For me, the performance on stage testified to the passion, mystery, and wonder of the real-life dance between the sexes. I was mesmerized. It's the complementary roles that undergird the mutuality and unity of the dance. When my husband, Brent, and I started our dance lessons, we discovered just how difficult it is for two people to move as one. Our efforts started out as a clumsy, comical disaster. We stepped on each other's toes, bashed heads (both literally and figuratively), pulled in opposite directions, and annihilated the steps and timing. It was painful and frustrating. But over the weeks, under the tutelage of our instructors, we slowly learned some rudimentary dance steps. Brent learned how to lead. I learned how to follow. It's the complementary roles that undergird the mutuality and unity of the dance. That's the paradox of dancing. And that's also the paradox of the complementarian view of male-female relationships. The term "complementarian" refers to the biblical concept that God created men and women equal in essence, but distinct (or complementary) in roles. 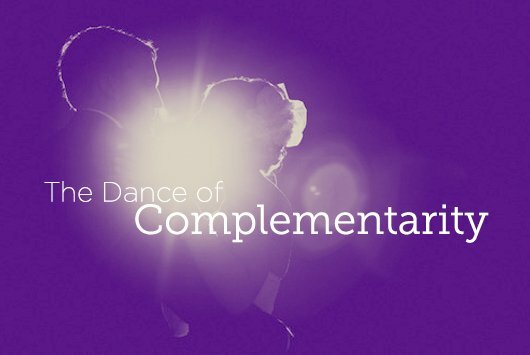 Complementarity fosters mutuality at a far deeper level than sameness does. The dictionary defines mutuality as "the quality or condition of reciprocity." Mutuality simply means that an interaction is reciprocal. Each party gives and receives something from the other. It's not a one-way relationship. That's not to say that the people are the same. Nor that they give and receive exactly the same thing. Nor that they do so in the same way. Mutuality doesn't require sameness. It can occur between people who have different things to offer. In fact, difference actually creates a powerful impetus to reciprocate. If the differences complement one another, they naturally foster mutuality and unity. Complementarity, mutuality, and unity are not incompatible concepts. They go hand in hand. For example, if I have some vanilla ice cream, and you have some vanilla ice cream, then what would the point of us sharing be? But if I have vanilla ice cream and you have chocolate sprinkles, then chances are we'll be motivated to reciprocate. We'll unite our ingredients and turn them into a delicious ice cream sundae we can both enjoy. Complementary parts, joined together as a mutual, united whole, are nowhere more evident than in the nature and character of God. The LORD Yahweh, the first Person of the Godhead, has a different role and function than the Lord Jesus, the second Person of the Godhead. The LORD Yahweh sends and the Lord Jesus goes. Though equal in being, the responsibility to lead rests on the LORD Yahweh's shoulders, while the responsibility to respond rests on Christ's. Though they have complementary roles, the clear teaching of the Bible is that our God is one (See Deut. 6:4; John 10:30). A profound mutuality and equality exists. The unity and indivisibility of the Godhead eclipses the difference in the role and function of the individual members. And so it ought to be with male and female. Male and female were created in the image of God to shine a spotlight on the nature and character of God. Male and female were created in the image of God to shine a spotlight on the nature and character of God and to tell the Jesus story. This leads me to conclude that complementarity and mutuality can and indeed should be evident in the lives of men and women who have been redeemed. What's more, it leads me to conclude that the overriding characteristic and focus of Christian male-female relationships ought to be unity. Complementary differences contribute to this goal, but do not contain it. This is a critical point that we dare not overlook. It's like the dance analogy. Since Brent and I are amateurs, our dance movements are mechanical and clumsy. His efforts to lead and my efforts to follow are awkward, highly noticeable, and not always effective. But this is not the case with an experienced dance couple. As they embrace their roles, they learn to move together as one harmonious unit. It becomes increasingly natural and effortless for each to do their part. And as they become better dancers, their complementary responsibilities take a backstage to the breathtaking beauty of their dance. The mutuality eclipses the complementarity. Do the roles still exist? Yes, unquestionably. But ultimately, the roles aren't the primary focus. Doing a great Tango or a lively Cha Cha is. We will get things wrong if we forget why God created men and women as counterparts. As complementarians, we must never lose sight of the proverbial "forest for the trees." We will get things wrong if we forget why God created men and women as counterparts. It's not so we can obsess and argue over our differences or our division of responsibility, or spend our lives micro-analyzing each step. Rather, it's that we might shine a spotlight on His glory by displaying the unity, joy, and sheer wonder of the dance. Can Complementarians Have It Both Ways?